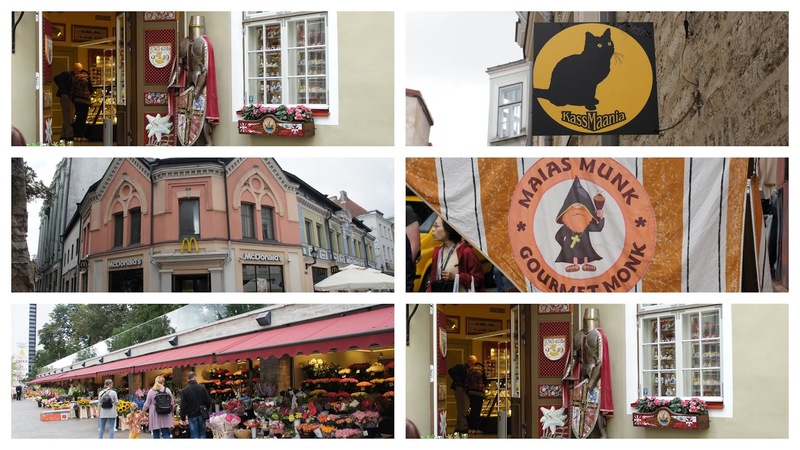 Our visit to Tallinn, Estonia was a surprisingly positive experience. Since Linda and I were having major pain issues with our legs we knew we would be unable to walk the ancient cobble stone walks through the Old Town part of the city. We still were not going to be stopped from visiting and seeing what we could. We took a shuttle to a place near the gates into the Old Town. We planned to have Ray do all of the walking and picture taking while we sat at an outdoor cafe and watched people. That way, we could still get a flavor of the city and later see pictures of what we missed. When we got off the shuttle, we saw some young people with rickshaws ready to take people on tours through the old part of the city. Linda and I looked at each other, then at Ray, and with little hesitation, decided to hop on a rickshaw and see the sites. We agreed to meet in a few hours for an early dinner at the Troika Cafe. George, our rickshaw driver and tour guide, was great. George, our rickshaw driver, was perfect for Linda and me. He took us everywhere and talked about the city. He took us to the upper level where we were able to get pictures of the whole city and see the interesting roofs on so many buildings. We saw Fat Margaret, which is a huge tower that was part of the ancient fortress protecting the city. We squeezed down the narrowest street in Tallinn and stopped by a park with lovely floral displays. For the rest of this post, I am going to use pictures with captions to show what we saw. Ray got some of the same pictures that we did, but he did not make it to the Upper Old Town. How lucky we were that George drove Linda and me there. This 16th century limestone cannon tower is called Fat Margaret (Paks Margareeta). Now, an Estonian maritime history museum occupies the inside. 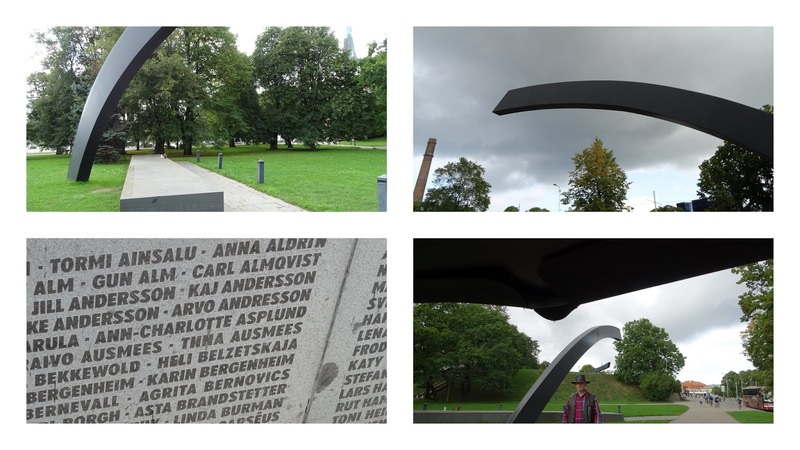 The Broken Line Monument was erected in memory of 852 people who lost their lives on the Estonia Ferry which sank in 1994. There were 137 people rescued, but the bodies of 757 were never found. These are some of the shops and signs we saw. Michael took a picture of Linda and me and then we walked through a beautiful garden. There were vintage pictures posted in various places to show what the gardens looked like when first constructed. The next collage has pictures of the Lucky Chimney Sweep. He is a bronze figure with a shiny nose. We were told that people rub his nose for good luck. 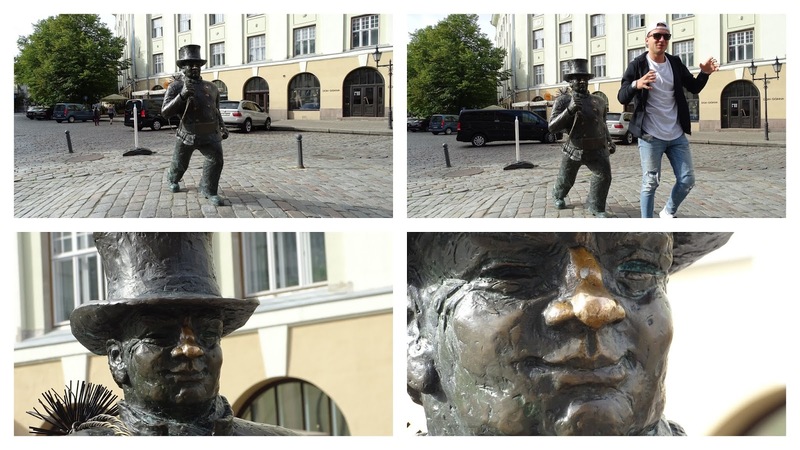 Later I learned that in the old days of Estonia, when people saw a chimney sweep they would try to rub his coat buttons for luck since the buttons were supposedly made of gold. I did not get any good pictures of this bronze statue's coat buttons, but as you can see....his nose is quite shiny from so many rubs. And, yes, we did rub his nose! At the end of the day, Linda and I met Ray and had a tasty snack at the Troika Cafe. It was fun to sit outside and enjoy the charm of the city. The birds were quite comfortable in sitting on our table, waiting for us to finish so that they could eat whatever was left. When we were ready to leave, our bill was inside a nesting doll. Ray's Moscow Mule, but not in a copper cup. Nesting Doll with our bill inside. This impatient bird is encouraging this customer to eat faster. There is so much more to say about Tallinn, but this post is getting quite long, so I will stop. We said good-bye to Tallinn, boarded the ship, and were able to relax on our deck as we watched the setting sun.